There are some technical difficulties on the phone number below. Swing ‘n’ Sinatra is a journey through the decades of this unforgettable genre, featuring songs from Sinatra, Ella Fitzgerald, Basie, Buble and even Jools Holland-style Jive! 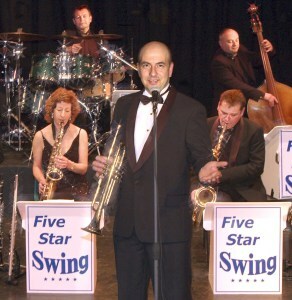 Five Star Swing’s singers and multi-instrumentalists have appeared at the Leicester Square Theatre, TV’s Military Wives, BBC Children in Need, Blackpool’s Tower Ballroom and with TV’s Strictly Dance Fever contestants.